MANILA, Philippines – (Updated April 1) The University of the Philippines - College Admission Test (UPCAT) results for Academic Year AY 2019-2020 are released online on Monday, April 1, 2019 or in more than five (5) months after the exams. "The UPCAT 2019 List of successful applicants is now ready for viewing at the UP System Office of Admissions in UP Diliman, QC at the corner of Kalaw and Quirino streets. 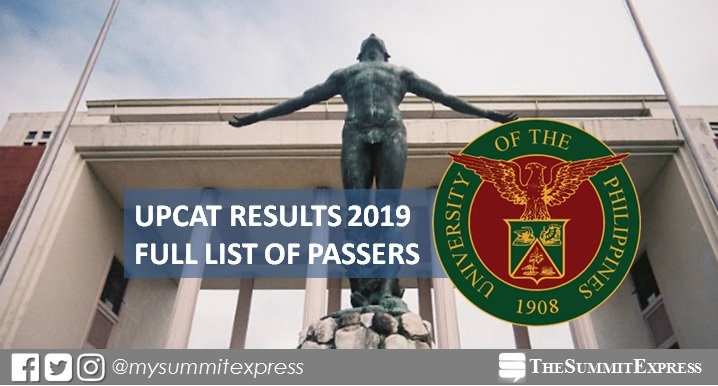 UPCAT was administered on October 27-28, 2018 in more than 18 test centers nationwide including UPEPP (Clarkfield, Pampanga), UP Visayas (Iloilo City), UP Los Baños (Laguna), UP Cebu (Cebu City), UP Tacloban College (Tacloban City), Cagayan de Oro City, UP Mindanao (Davao City), UP Baguio (Baguio City) and UP Diliman (Quezon City). UPDATE: UPCAT results now available online. Please go to the UPCAT main website https://upcat.up.edu.ph. Carefully read the instructions on how to view your application results. Press the APPLICATION STATUS button at the sidebar. Log in with the email and password you used in your online application. If you applied manually, use the contact email address you put in your UPCAT application to create new account. If you have problems logging in, please follow the instructions provided. If you received an offer for admission, you are required to reply starting April 7 until April 14, 2019. Replies to the offer after the deadline will no longer be considered. The new UPCAT results portal. Here's the list of UPCAT passers as shared online, courtesy of netizen Kisha Marielle Beringuela. The examination was originally set on September 15 and 16 but rescheduled to later date due to the impact of Typhoon Ompong on Northern Luzon and Eastern Seaboard including Western Visayas, and in consideration of the nationwide scope of the exam that entails synchronized travel arrangements among others which pose undue risks to both UPCAT examinees and UPCAT personnel. There were more than 100,000 takers of the UPCAT according to UP Vice President for Academic Affairs Cynthia Bautista. On average, only 17 percent of the hopefuls pass the UPCAT. Aside from the online availability of results, UP said a list of qualifiers will be sent to the principal of respective schools. Individual notices will also be sent to all examinees. "If you qualify for admission to UP, register according to the instructions provided by the college or unit to which you have been accepted," UP Admissions added. The UPCAT consists of 4 subtests: Language Proficiency (in English and Filipino), Reading Comprehension (in English and Filipino), Science, and Math. Standardized UPCAT scores are combined with the weighted average of the last 3 years of high school final grades to determine the UP admission grade (UPG). Passers of UPCAT are screened for acceptance into one of the degree programs they chose. Different grade predictors are used for different programs. Campus qualifiers are ranked according to the degree program predictor. Top-ranking qualifiers are accepted according to the number of slots available for that program. UP is highly committed to admitting the best students and providing increased access to quality higher education. UP Vice President for Public Affairs Jose Dalisay Jr. said that the school's free tuition policy led to the increase in the number of applicants. UP Oblation Scholarship is given to the top fifty UPCAT qualifiers. The benefits include free tuition, miscellaneous and laboratory fees, a semestral book subsidy and a monthly incentive and transportation allowance. Recipients may enjoy the UP Oblation Scholarship throughout the normal length of time required to finish their chosen degree program, provided they maintain the required grade point average. For those in the accelerated medical program (INTARMED), however, only the first four years are covered by this grant. Filipino graduates from the Top 10 of the graduating classes of public high schools may apply for freshman automatic admission (i.e. without having to take the UPCAT) for SY 2019-2020, provided they meet other UP admission requirements, as provided by a transitory provision of the Iskolar ng Bayan Law of 2014. Good luck and congratulations in advance to all aspiring Isko and Iska!